2015-16 O-Pee-Chee Rainbow Foil Black of Emile Poirier. Short Print Numbered 076/100. 2015-16 Fleer Showcase Flair Autograph Patch Auto #60 Emile Poirier 28/65 !! 2015-16 EMILE POIRIER FLEER FLAIR SHOWCASE BLUE ICE 60/199 ROOKIE FLAMES RC. Condition is Brand New. Shipped with USPS First Class Package. 2015-16 EMILE PORIER SP AUTHENTIC SIGN OF THE TIMES ROOKIES AUTO 295/299 FLAMES. Condition is Brand New. Shipped with USPS First Class Package. 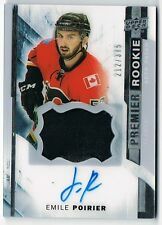 2015-16 EMILE POIRIER UPPER DECK UD TRILOGY ROOKIE PREMIERS 297/399 FLAMES. Condition is Brand New. Shipped with USPS First Class Package. 2015 2016 Upper Deck Young Guns UD Canvas Rookie of Calgary Flames Forward Emile Poirier. Card is graded BGS 9.5 Card number is C92. Free Shipping. Check out my store for more sports cards and other collectibles. Have a good day. The cards shown are scans of the actual cards; cards looks in Nrmt condition. The card shown are scans of the actual card; card looks in Nrmt condition. 2015/16 Fleer Showcase Ottawa Senators Emile Poirier Flair Showcase GUJ RC card Row 0 Seat 60. The card number is R72.